1. Combine half the watermelon and half the water in a blender; puree. Pour through a coarse strainer into a large container. Repeat with the remaining watermelon and water. Stir in lime juice. Refrigerate until well chilled, about 4 hours. 2. To serve, stir in club soda (or seltzer) and garnish with lime. 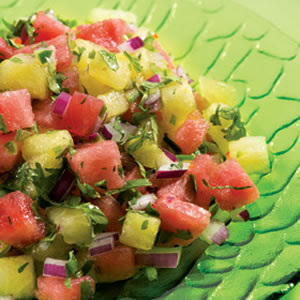 Place watermelon, jalapenos, cilantro, lime juice and onion in a medium bowl; stir well to combine. Serve at room temperature or chilled. 1. 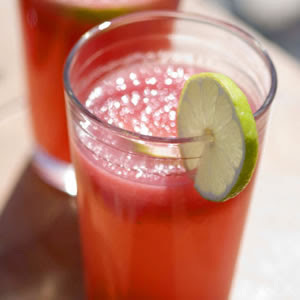 Place watermelon and lime juice in a food processor; process until smooth. Set a sieve over a large bowl and press the puree through to remove tiny seeds. 2. 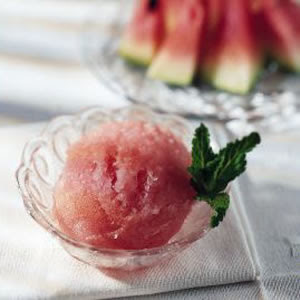 Pour the watermelon mixture into a shallow metal pan and freeze until ice crystals form around the edges, about 30 minutes. Stir the ice crystals into the center of the pan and return to the freezer; repeat every 20 minutes until all the liquid is frozen. 3. Serve immediately or transfer to a storage container and let harden in the freezer for 1 to 1 1/2 hours. Serve in chilled dishes.